Accounting and public accounting curriculum at Hope prepare students for work in a variety of business settings. Good news! The National Association of State Boards of Accountancy (NASBA) has released the 2016 CPA exam results. 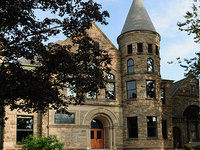 Hope College made the National Ranking of Institutions by Pass Rate, a list of the top 40 schools. Hope had 35 candidates take the exam for the first time in 2016 and ranked 13th in the nation in pass rates out of 294 institutions in the Medium Program (21–60 candidates) category. Accounting students have two options for degree programs. The accounting major requires 126 credit hours to graduate and prepares students for careers in private industry, governmental accounting, and banking and finance. The public accounting major requires 150 credit hours to graduate, but with careful planning, students can complete the professional certified public accounting major in just four years. The pass rate on the CPA exam following graduation for Hope graduates is consistently one of the highest among Michigan colleges. Students who wish to major in either program should contact a member of the accounting staff early in their studies as the programs require a special sequence of courses. To declare a major in accounting or public accounting, submit a completed major declaration form to the Department of Economics and Business Office. *Three of these five accounting classes are required. 69 credit hours of business, economics, accounting and statistics. The Hope College public accounting track includes 71 credit hours of these courses. See your advisor if you plan to take the exam in another state. Contact the department office to get connected to accounting faculty or email a faculty member.